“Championship. Championship. 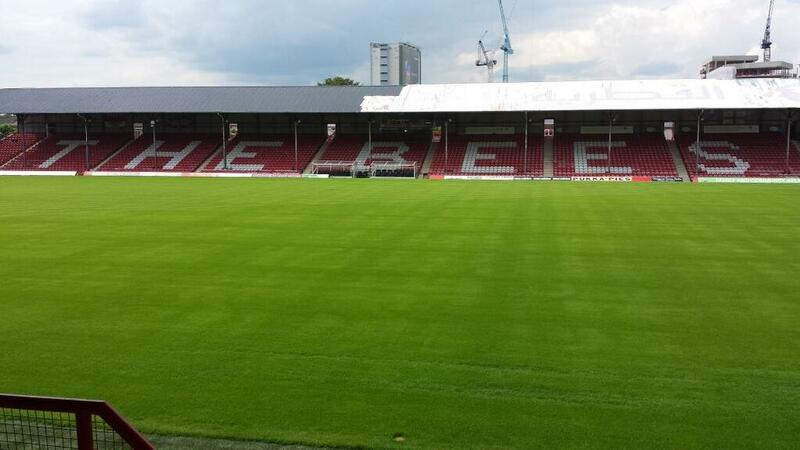 Here come the Bees in the Championship”. Not my words but those of Billy Reeves and Bee Faction in their promotion celebrating, ‘Hey Brentford’ song. Still available on free download, this terrace anthem has been my earworm for most of the summer. And thankfully so, with the gap from promotion to the Championship an excruciating wait. Fortunately, this has been just one of numerous distractions to keep me occupied. Some bad : the departure of Clayton Donaldson, the leak of the away kit and the most cringeworthy tweet to ever come out of ‘official’ channels. 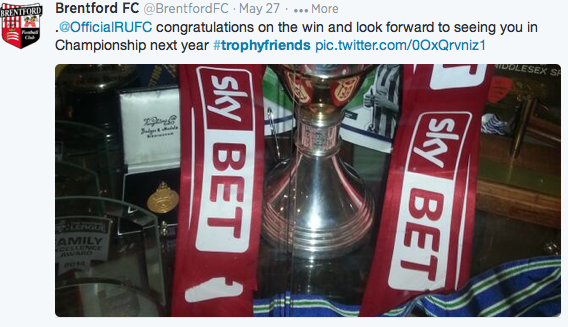 I have no idea who ‘drives’ @brentfordfc on Twitter but the reaction to the phrase ‘#trophyfriends’ was one of almost universal embarrassment. Still, that was very much the thin end of the wedge and there have been more positives to focus on than I could shake a stick at. 10: The play offs. An odd place to start, especially given our track record, but wasn’t it great to watch the annual torture session at the W place with so much direct interest for Brentford? Who from Rotherham or Leyton Orient would be joining us next season and who would suffer that ultimate kick in the knackers? Likewise, could Uwe do us a huge favour and keep the Loftus Road mob in the Championship. 9: Pre-season friendlies. A complete contrast to last season where, instead of a full priced game against a Celtic reserve side, whose support were allowed free reign of Griffin Park, we’ve got visits from the continent. There could even be a smattering of World Cup stars present as both Nice and Espanyol visit, with tickets starting form as little as £5 for adults. Great work. 8: The World Cup. Putting England to one side, it has been a stunning diversion from the pain of pre-season. From the second day destruction of Spain by the Netherlands right up to the hosts being on the wrong end of a 7(seven)-1 semi-final bracketing, this has really been captivating stuff. The likes of Algeria and Costa Rica have helped demonstrate that cup football is one of the most exciting sports on the planet – moreso when there is this much in such a short space of time. 7: Diaries. Peter Gilham’s tour diary is always a great read. A fascinating view behind the curtain as to what really makes up a pre-season training camp – for both the players and the backroom staff. Moreso, it’s a sign that the campaign is almost upon us. 6: The roof is finally covered. At last. They squatted in TW8 for longer than the Kew Bridge ‘Eco village’ but Qatar Airways have finally been evicted from the roof of the Bill Axbey stand on New Road. We await news as to who replaces them with intrigue. 3: Ticket prices. These increased, but marginally. The price rise was a token one and nowhere near the amount I would have expected from a club with a limited capacity (relative to our rivals) and now playing in a higher division. This really was a bold decision and they have been instantly rewarded with over 5000 sales. Thank you! 2: Mark Devlin’s strip tease. 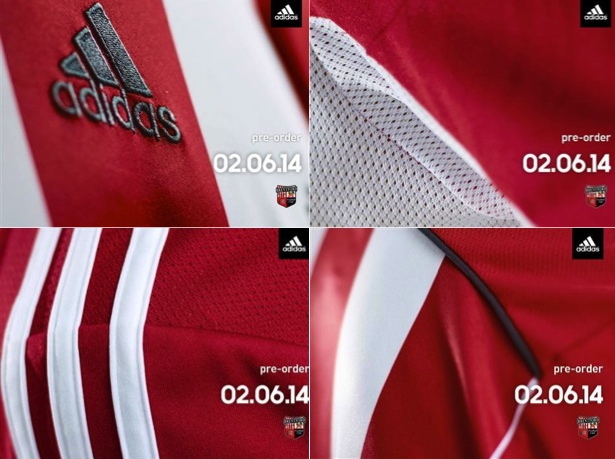 Of course, I mean the teaser campaign that has led to the unveiling of our home kit. I liked this idea – despite my desperation to see the ‘full reveal’ – and we’ve been rewarded with a great shirt. The away shirt, in particular, aside from the cracking design spec, achieves that rare feat of making the stick on sponsor’s logo look marginally acceptable. And when that happens, you know something good must be happening. And if you need any reminder of how we got here, ‘Celebrating like they’d won the FA Cup…..’ (The story of Brentford’s 2013/14 promotion campaign, amongst other football related chatter) – is now available as a digital book. Featuring the best of the not so bad columns from last season, and some new content, you can download it here for your kindle / digital device. 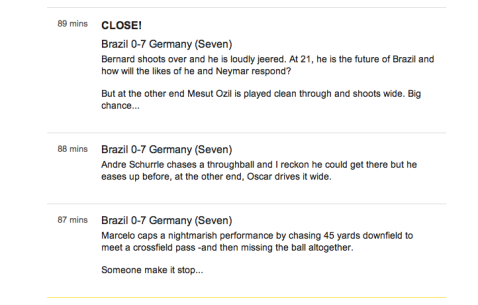 I can only wonder what Jake Reeves thought last night as Germany humiliated Brazil 7 (seven) – 1. Whilst most people were focusing on the margin of victory, for me there was massive pay back for Luiz. Specifically, because of the horrific injury he inflicted on Reeves in February of last year as Chelsea finally managed to knock Brentford out of the FA Cup. Indeed, the comparison had already been noted with the BBC commentary team highlighting the ‘defender’ for elbowing Miroslav Klose with an observation that (apparently) he’d done similar before at Chelsea. 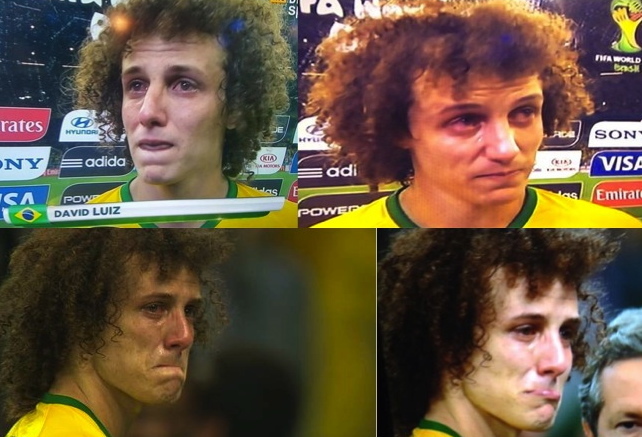 Didn’t we remember that in TW8 as social networks were awash with comments about Jake and, equally, pictures of Luiz crying his eyes out after the game. Whilst Fred seemed to be the ‘blame’ figure for the Brazil boo boys, for me the headless chicken that was David Luiz seemed most culpable in a team performance that was about as shocking as they come. I’m sure Jake is too much the professional to take any pleasure from what happened but, personally, I’m just not that good a man. So here’s the montage of just some of those shots doing the Twitter rounds last night. The other thing to really get me excited was the return of brackets. Anybody who has read this column or ‘Celebrating like they’d won the FA Cup…..’ will know of my love / obsession with what happens on that magical moment when the scoreboard ticks over to register a seventh goal. Brackets appear on the videprinter. Any team who have managed seven goals or more have the privilege of their score also being written, in addition to the standard numerical format. Just to make the point that – this really isn’t a typo; they have been hammered by that many. Moreso is the debate that accompanies this. I’m of the belief that the clarifying 7 (seven), should be in lower case font. Discreetly saying that there has actually been a goal-fest and it’s not some numpty in the production booth with fat-fingers. Sky, on the other hand, go for a full upper case 7 (SEVEN). It’s a gauche block-capitalled effect to really push home the point that someone has been on the wrong end of a thrashing. It’s gloating for the sake of it. Well last night the BBC, I’m very pleased to say, got in on the brackets act as their website videprinter recorded the fact with a third entry into the discussion: 7 (Seven). Remember this moment, I don’t think you’ll ever see brackets in a World Cup semi final ever again. ‘Celebrating like they’d won the FA Cup…..’ (The story of Brentford’s season 2013/14, amongst other football related chatter) – is now available as a digital book. Featuring the best of the not so bad columns from last season, and some new content, you can download it here for your kindle / digital device. Are points in the bag better than games in hand? Brentford fans must feel like they are dreaming this morning after Wolves made it one point from the last six following last night’s shock defeat at Crawley. It was a result that few saw coming (myself included) and, following our own win over Leyton Orient on Saturday, has lifted spirits even further. The proverbial ‘favour from other teams’ is all well and good but don’t forget that, as it stands, Wolves are still top of the table. That’s a fact. They are a point clear (effectively two with their gargantuan goal difference) and so still the team in the box seat. Brentford, of course, have the ultimate destiny back in our own hands but Wolves have the points advantage. The two clichés in football I probably find have some actual resonance are, firstly, ‘The League is a marathon not a sprint’ (see Bournemouth last season) but also ‘Points in the bag are better than games in hand’. 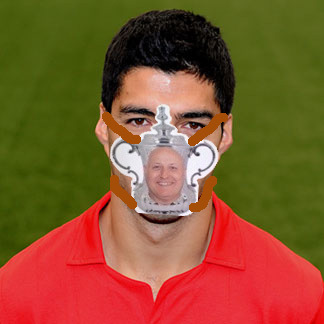 Having to play that ‘one off’ game can bring its own pressures and this was no better illustrated than last night. The psychological advantage of getting a win when your rivals aren’t playing is immense – if you can get it right. Hand in hand with that goes the extra pressure of knowing what said win will do – as was illustrated last night with the game effectively turned into a mini cup final. Wolves manager Kenny Jackett gave a very honest press conference afterwards, saying that the game “passed us by and that is a big frustration, particularly when it is one of the games that we have in hand” (perhaps Russell Slade should take note on how to speak to the media after a defeat). 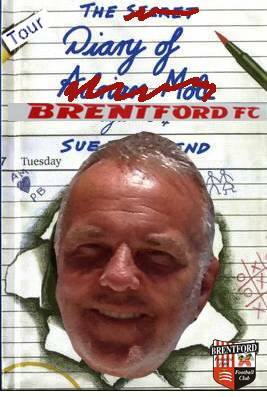 As big a frustration for me, as a Brentford fan, was trying to keep track with the game. Although ‘Beesplayer’ does give access to every commentary (a very handy function, IF it works) mine seemed locked on the Charlton match. 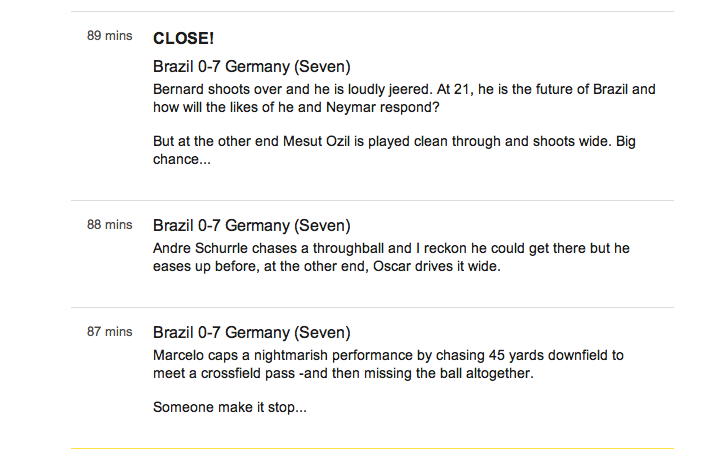 So, instead, I was stuck with the BBC ‘live text’ updates on their 21st century videprinter. Its not an easy way to watch a game due to the torturous update speeds and generic descriptions as to the action. Last night’s game seemed to consist of efforts from 35 yards but were these the sort of ‘fizzing pile-drivers to test a goalkeeper’, Adam Forshaw style? Or were they hopeless punts from distance that had less chance of going in than a Miguel Llera set piece? If anything, he hit it too well….or did he?? Watching a game on the BBC is a great way of knowing what is happening, if you are a fan of factual football. However, as a way of getting that genuine ‘gut feel’ as to who is on top and how things might turn out, then it is about as much help as Robert Madley. Still, even I couldn’t fail but be moved to excitement by what happened just after the mid-way point of the first half. 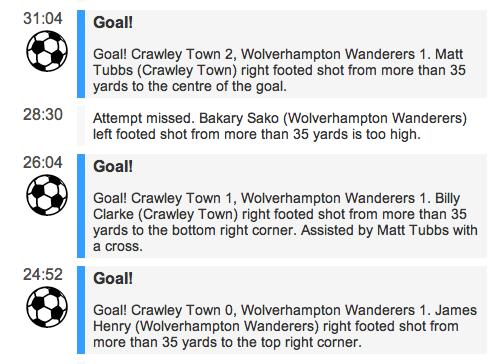 It began, ironically when you consider how many games Crawley have lost to the weather, raining goals. Then it stopped. And the torture of waiting began. But…. We all know the final score. Wolves remain top and, although the bookies still make them favourites for the title and promotion, Brentford have control back. Coventry on Saturday will not be an easy task whilst I have no doubt that League One will throw up more than a few surprises before the season ends. I’ll happily accept any gift from another team but, ultimately, it counts for nothing if we can’t do it ourselves. Fortunately, I have every confidence we will.